the release; every single musical work is a striking musical experience in its own right. El triste juego de la Polka espectral (2005) 10:01 12,80 kr. Jubilate Deo in primavera (2005) 7:20 9,60 kr. Cantus (2005) 13:12 12,80 kr. Farbentiegel II (2004) 9:20 9,60 kr. Trionetics (2004) 8:31 9,60 kr. Jaco (2005) 7:10 9,60 kr. A release with music for recorder, saxophone and percussion is automatically a musical innovation. Before Alpha was formed in 2004 there was no repertoire for this configuration. 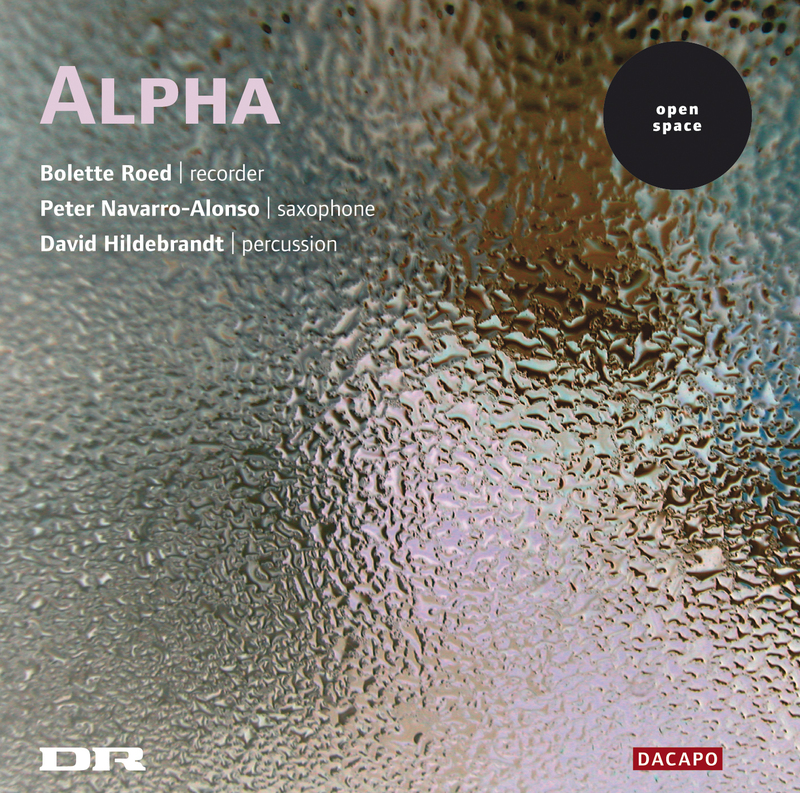 All the works on this CD have therefore been written specifically for Alpha in 2004-05 by a handful of living composers from three generations, and even after a quick listen to the CD the results of the composers' work give rise to two small conclusions: first, that Danish composition music - right now - is a multifaceted, highly original phenomenon; and secondly that the combination of recorder, saxophone and percussion is a really good idea! The quite special thing about this trio formation is the breadth of sonorities it can muster. A percussion set is of course wide-ranging in itself, but saxophones and recorders too span a wider range of sounds and registers than people normally think. On this release three saxophones and seven different recorders are used, and together with the percussion and the clutch of composers represented, this makes for an entirely original recording - both in musical breadth and compositional clout. The first composer on the CD is the youngest. Eblis Álvarez was born in 1977 in Bogotá, Colombia, and made his debut in 2004 from the composition class of the Royal Danish Academy of Music in Copenhagen. As a composer, he too ranges wide: he has participated in a number of contemporary music festivals, and in various projects that explore rock and South American folk music. The work on this release, El triste juego de la polka espectral (which can be translated the sad game of the spectral polka\) is also inspired by folk music, but in this case not primarily South American - although this does seem to lurk somewhere or other in the background - but the Burmese folk music of which Álvarez has heard Alpha play arrangements. And the source of inspiration emerges clearly throughout the work; the music is almost transparently clear in its texture, consisting as it does of small, pithy rhythmic figures that are repeated and varied for a very long time in a long, homogeneously bright belt of sound. In this way - in its apparent endlessness - the music is like a version of the religious and secular music of the Far East, stressing its constant variation and non-organic development. Ib Nørholm's Jubilate Deo in primavere is, as the title reveals, a kind of a song of praise in (the music of) the spring. Nørholm was born in 1931 and with this work from 2005 has reached his opus 182. And the work confirms the fact that throughout those 182 he has tried widely differing approaches characterized by an insistent exploration of all musical possibilities. In the 1960s Ib Nørholm was a leading figure in the invention of a postmodern musical style - ‘stylistic pluralism' - which (briefly) can be regarded as a recognition that anything composed before, and the ways in which this has been done, can be (re)used in new compositions. This idea - that the history of music constitutes a reservoir of possibilities for the composer - can be used directly as an approach to Jubilate Deo in primavere. For technically the work is to a great extent a kind of free counterpoint, in principle a technique from a much earlier date. The individual parts relate to one another with imitations and responses, while remaining fully valid in themselves, and throughout the work Nørholm is able, with very simple resources, to let the various instruments paint a vivid pastoral soundscape. Nevertheless, there is also a sense of flux: the shifting of the music in sections with abrupt changes in the percussion arsenal produces surprising sound dynamics. Despite his age, Søren Nils Eichberg, born in 1973, has an impressive CV - as a composer, pianist and conductor. His official opus list counts only works from the past five years, so it is all the more remarkable that his piece for violin and orchestra Qilaatersorneq from 2001 won First Prize at the Queen Elisabeth Competition in Brussels. The work on this release, Cantus, is in several respects highly unusual. In the first place the form of the work is at least superficially disjointed - but in a positive way. Instead of forming links between the different musical phrases with temporary bridging passages, the music is sectional and almost mechanically divided. Each phrase is given a place and repeated to a point, then a new phrase takes over. All the same the music does cohere; the individual phrases are related, and as the work progresses one learns more and more about the kind of musical entities they are. Another striking feature is the composer's dexterity and the way it shows its willingness to accommodate the listener. The elements of the music are telling and well wrought and they sound in the instruments where they sound good. In that sense the music seems much more heard than thought, within an aesthe-tic framework where the listener's experience and understanding take pride of place. Bent Lorentzen's work Farbentiegel II is a study in sonorities (a Farbentiegel is a crucible or melting-pot for colours). Lorentzen was born in 1935 and is probably best known for a string of prizewinning music-drama works. Yet he also has a large instrumental oeuvre behind him, and it seems important to the understanding of this that much of his musical development in the 1960s took place at the Swedish electronic music studio EMS. For the work at the mixer seems to have been transferred to acoustic instruments; in the case of Farbentiegel II the music bears the marks of minutely detailed work with the sound - for example with noise effects, timbres, spatial effects and manipulation of pitches - as much as with the placing of the sounds in time in a composed sequence. For as the title suggests, there is a predetermined - but hardly audible - rhythmic mould which deals with the temporal aspect. The form of Farbentiegel II falls into two parts and is at once simple and effective. The first third is both measured and subdued, while the second two-thirds is violently unstable. First the metallic percussion (both as deep, broad beats and small insertions), the deep drone of the saxophone and the distorted eruptions of the recorder are mixed in a sequence of overlaps and repetitions with no real development. It is so to speak a totality consisting of recurring sound-events that work in and of themselves. The second section, on the other hand, is pure motion. Here the drones are replaced by unstable notes that are trilled and bent with no fixation. Here too the percussion, whose gongs and tam have up to this point actually produced highly complex, saturated sounds, becomes particularly unstable; the dominant instrument is now tubular bells whose tone is bent back and forward as a result of their immersion in water as they are struck. Thus the work more and more becomes a unified soundscape whose individual elements become harder and harder to distinguish. The title of Svend Hvidtfelt Nielsen's work, Trionetics, gives us a good clue to the point of the music. Quite freely translated - the composer has presumably invented the word himself - Trionetics means studies in how a trio is specifically manifested. This interpretation fits in well with Svend Hvidtfelt Nielsen's history, since at one time he himself thought that precisely the exploration of concrete musical phenomena - especially phenomena that have something to do with music and time - has been a characteristic feature of himself and his musical contemporaries since the end of the 1980s, with its origin in the composition training at the Royal Danish Academy of Music in Århus and the teachers Per Nørgård and Karl Aage Rasmussen. Irrespective of how much of this the composer has intentionally associated with his choice of title, Trionetics is an ensemble piece with a capital E. Although the individual melody lines of the three instruments would probably work as melodies in their own right, it is in the interplay that meaning arises. The piece develops as a stronger and stronger challenge to both musicians and listener; it is initiated with a shared spirit among the parts, with imitations and joint emphases, but very quickly the small motifs develop rhythmically such that small displacements, replacements, unpredictable accents and incommensurable parallel sequences create a dizzying impression. The tempo is for the most part fast and the notes short, so the metaphor of the musical 100-metre race seems appropriate. The difference - from the world of athletics - is that Trionetics is run in hilly terrain, the pace-length of the competitors changes constantly, and the runners rarely start at the same time. The last work on the CD, Jaco, was written by the ensemble itself as a taut fusion of several elements. It is at once composition and improvisation, and at once acoustic and electronic. Structurally, the piece is built up as a progression of accents played at different tempi by the different instruments. The form is simple: a structuring introduction with insistent emphases accompanied by the small discharges of the recorder and a little melody. By the middle of the piece everything is brightly crackling, until a calm, almost meditative section forms an ebb-like conclusion. That the work is midway between the acoustic and the electronic should be understood in the sense that Jaco has a large number of odd sounds that one does not normally associate with the acoustic instruments of the ensemble. They are a result of the fact that the microphones used in the recording - or in the concert situation in ordinary amplification - have deliberately been placed very close to or inside the instrument they are recording. This amplifies sounds that the human ear does not normally perceive - for example the noise that arises when the saxophonist tongues the reed or the unstable, surprisingly long fade-out that the kalimba drum produces at the end of the work. In other words, Jaco is music in a state of flux between the acoustic and the electronic - a fusion that, thanks to a simple technical manoeuvre, brings the listener right into the instruments' normally private sound--universe. Regardless of these interesting theoretical perspectives, Jaco is a work that stimulates both the brain and the experience of the senses; it is a sharply delineated multiplicity of sounds which in an extremely dense rhythmic sequence brings direct musical energy close to the listener.